If you frequently encounter snow or ice, or if the temperature consistently approaches freezing, your tires need the extra grip and turning capabilities that only winter tires can deliver. Even if you have 4-wheel drive or all-wheel drive, you still need winter tires on the front and back to conquer the elements and stay safe. Winter tires are designed to perform better in a wide range of wintry conditions such as wet roads, snow and ice. They also improve your vehicle's grip and performance in these conditions and they shorten your braking distances for better safety. In cold temperatures, summer tires do not provide the performance that winter road conditions requires. They are made with different materials optimized for warmer conditions and they can, for instance, harden under cold temperature, thus lowering their gripping ability. Summer tires have difficulty gripping the road in snow or icy conditions. All-season tires are designed to be driven year-round, but if you live in an area with severe winter conditions (heavy snow or ice), they may not be sufficient. All-season tires are designed to perform well in a large range of conditions, but not to handle the worst. Winter tires can provide you with the extra grip you need to get through deeper snow or ice-covered roads. Three peak mountain snowflake symbol and "M+S"
Only tires which have the Three Peak Mountain Snowflake symbol (a snowflake inside a mountain) have been tested for use in severe snow conditions. They meet or exceed industry-established severe snow traction performance requirements. Tires with this marking are what we traditionally call "winter tires". They have been specially designed to improve your car’s performance in moderate winter conditions. 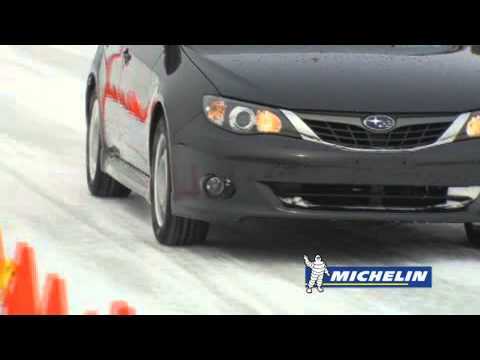 Winter tires do not wear more quickly in winter conditions when compared to all-season tires. The rubber is different, but comparable in durability. You can fit them early to enjoy maximum benefits. When wear bar indicator is visible (2/32nds). See how to measure wear. After 5 years of usage, you should make sure they are thoroughly inspected at least once per year. The cost of winter tires is generally equivalent if not less than standard replacement tires on a vehicle. Over the life of your vehicle, you will likely need to purchase at least one new set of tires. Equipping the vehicle with winter tires during the first winter season will represent the same cost in the end but will optimize the performance in treacherous driving conditions with the benefit of added safety. For maximum safety and control over your vehicle in cold weather conditions, fit winter tires on all four wheels. Why not only two tires? Fitting winter tires just on the front axle can mean that the rear axle slides more easily. You risk spinning the vehicle under acceleration (rear wheel drive cars) or when turning (front or rear wheel drive). Fitting only two winter tires on the rear axle increases the risk of driving straight on when you try to take a turn. 4-Wheel Drive does provide optimized power transmission delivery but minimal assistance in transverse handling and braking situations. With winter tires, you can feel optimized levels of traction during all manoeuvers including acceleration, braking, and handling. Do I need studded tires? Do you drive more on icy roads than snowy roads? Studded tires are the right choice for you. Do you drive more on snowy roads or a variety of different road conditions? 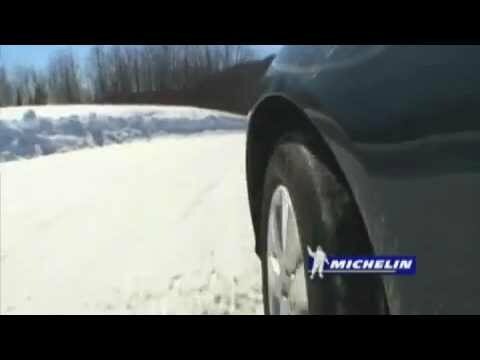 Non-studded winter tires could be a better choice. Tires with metal studs inserted into the tread to increases grip on ice, making it easier to start and stop on the least friendly road surfaces imaginable. Studded tires are not ideal for driving on roads that are not covered with ice, as they can increase braking distance, road noise and wear. Studded tires are not allowed in some states in the United States. These states may completely ban the use of studded tires or only allow their use during certain times of the year. Check with your local officials to ensure studded tires are allowed in your state before you purshase studded tires. You should install your winter tires when the temperature consistently approaches freezing. Ask a technician to make sure the tires are rotated from where they were during the last winter season. You should also ask for the remaining tread depth to be measured and the air pressure to be adjusted. Tires lose pressure as the temperature drops. For example, if a tire has a pressure of 29 psi at 62º F, the pressure may be only 26 psi at 32ºF. So it’s really important to check your pressure at least once a month. If you are adjusting your tire pressure outside in ambient temperature, set it to the vehicle manufacturers’ recommended pressures. Only adjust pressure when tires are cold---either stationary for 3 hours or more or driven less than 1 mile. If storing outdoors raise tires off the ground and use water proof covering with holes to prevent moisture build-up. If tires are on vehicle, store on blocks to remove load from the tires. Maintain placard inflation pressure. Snow chains should be used on packed snow. If you don't own a set, quality retailers can advise you on the most suitable snow chains for your vehicle and tire size. There should be, on average, a minimum of 12 chains crossing the tire. Before your journey, take time to learn how to install and remove the chains efficiently. If you're travelling to certain ski resorts you may be required to install snow chains (check before you travel). A small crack on the windshield may, in the extreme cold, become a large crack. Therefore you should repair it before winter sets in. Make sure your windshield washer fluid tank is full and in good condition. Do not dilute windshield washer fluid with water: it could freeze at low temperatures. Checking reports on road conditions will help you make driving decisions and avoid dangerous situations. If conditions are particularly bad, you may want to stay off the roads. Identify the person/people to call in case of emergency (ICE) by putting these three letters before their name(s) in your list of cell phone contacts. Make sure you always have at least half a tank of gas to avoid a frozen fuel line. Also, carry extra windshield washer fluid to ensure proper visibility. You don’t have to live in Iceland to benefit from winter tires. If you frequently encounter snow or ice, or if the temperature is consistently near freezing, your tires need the extra grip and turning capabilities that only winter tires can deliver. Even if you have 4-wheel drive or all-wheel drive, you still need winter tires on the front and back to conquer the elements and help you stay safe. Turning in bad weather requires extra attention. Before turning, slow down while traveling in a straight line. While turning, maintain a slow and regular speed. If you accelerate suddenly, your tires could lose traction. While turning, don’t make any sudden steering wheel movements. Try to avoid sudden braking in winter weather. Only brake in a straight line before the turn, and do so gradually. Do not brake during the turn. Increase your following distance from other cars significantly. If your wheels lock and slide, release the brake pedal to recover traction, then slowly brake again. Keep this checklist in mind as you navigate the winter weather. Drive with two hands. Always. Try to avoid changing lanes in slush. It’s safer to change lanes when slush is not on the road. If using chains, check for proper clearance between the tire and the vehicle, as well as the clearance between dual tires.